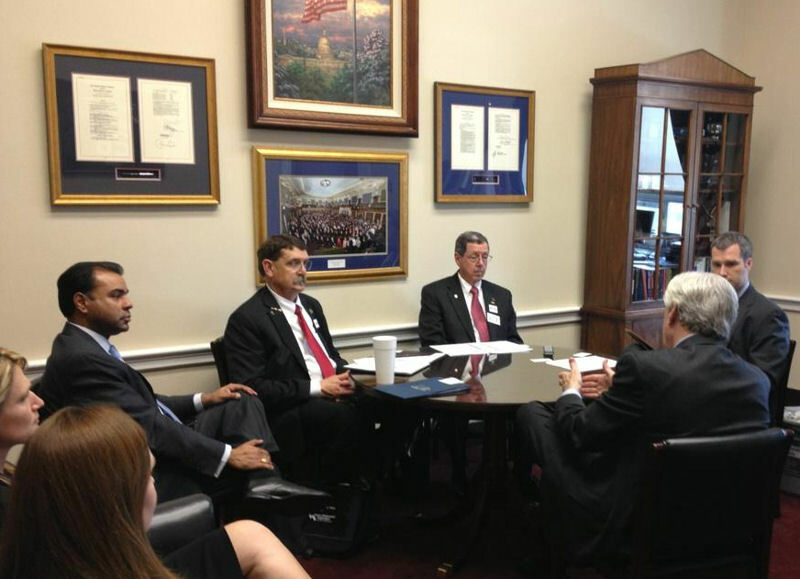 Water Environment Federation (WEF; Alexandria, Va.) member Curtis Smalley, fourth from left, attends a meeting with a Texas congressional representative during the 2013 Water Matters! Fly-In. Photo courtesy of Smalley. Photo courtesy of Curtis Smalley. Water Environment Federation (WEF; Alexandria, Va.) members met with government officials to take a stand for water infrastructure funding, as well as other water industry issues, at the third annual Water Matters! Fly-In. 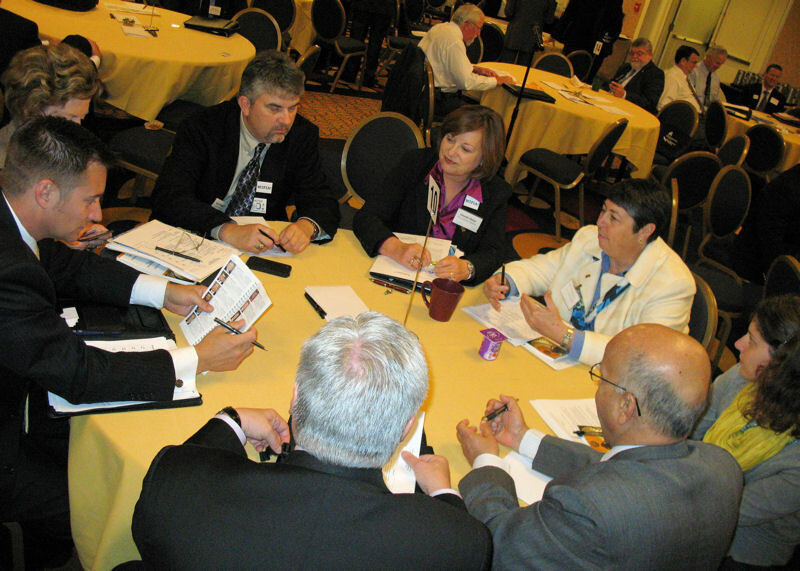 The event, hosted jointly by WEF and the American Water Works Association (AWWA; Denver) on April 17 and 18, provided participants with valuable personal and professional experience. A total of 172 water utility leaders from across the United States gathered in Washington, D.C. Attendees met with their congressional representatives to ask for support in creating a Water Infrastructure Finance and Innovation Authority (WIFIA) and obtaining 2012-level funding for the Drinking Water and Clean Water State Revolving funds (SRFs) as complements to WIFIA, according to an AWWA news release. Smalley had a busy visit, attending meetings with staff in the offices of U.S. Reps. Roger Williams (R–Texas), John Carter (R–Texas), Joe Barton (R–Texas), Lloyd Doggett (R–Texas), Michael Burgess (R–Texas), and Henry Cuellar (D–Texas), and U.S. Sens. John Cornyn (R–Texas) and Ted Cruz (R–Texas). Dale E. Kocarek, a 30-year member of WEF and past president of the Ohio Water Environment Association, is a 3-year veteran of the fly-in. He attended because it provides both personal and professional value, he said. Delegations of water professionals from Texas representing both WEF and American Water Works Association (AWWA; Denver) prepare for visits to their state officials. Photos courtesy of AWWA. “I believe in participatory government, and attempting to do something is very important,” Kocarek said. With a life-long interest in history and politics, as well as education and experience in sanitary and environmental engineering, Kocarek said he feels that participating in government is a civic duty. Kocarek joined three other attendees to meet with Sen. Rob Portman (R–Ohio) and Reps. Bob Gibss (R–Ohio) and Bob Latta (R– Ohio), as well as two congressional aides from House Speaker John Boehner’s (R–Ohio) office, he said. The group discussed the need for funding and how tax reform could affect funding of water projects and municipal bonds, affordability, and integrated planning, he said. Kocarek, a new member of the WEF Government Affairs Committee (GAC), said the event helps members become more engaged with the committee. “I feel that the WEF GAC does meaningful work, and I want to be a part of it,” he said. Kocarek also chairs the Ohio Water Environment Association’s Government Affairs Committee. The experience also gave Kocarek the opportunity to get to know both other industry professionals and congressional officials, to get his state association more engaged, and to build unity between the association and the Ohio section of AWWA, he said. 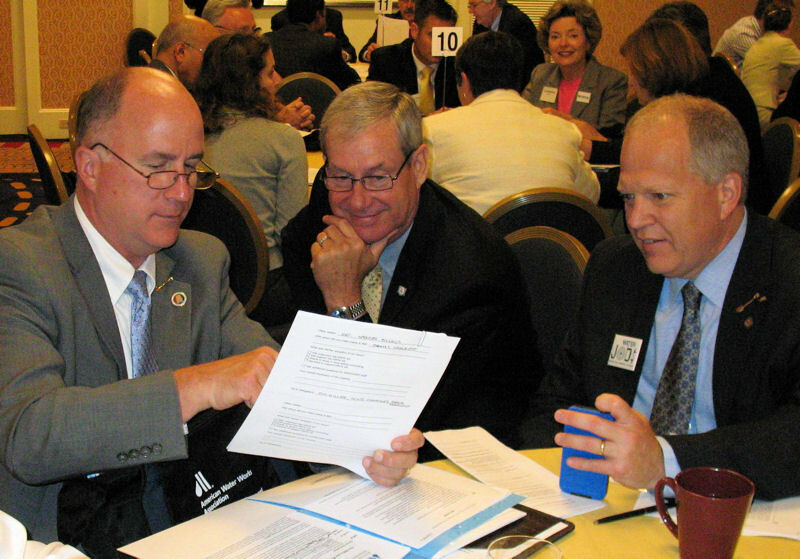 From right, WEF trustee Scott Cummings, and American Water Works Association (Denver) members Jim Miller and Frank Eskridge represent Alabama during visits to state officials at the Fly In. Photo courtesy of AWWA. Scott Cummings, a WEF trustee and a senior project manager at CH2M Hill (Englewood, Colo.), also is a 3-year veteran of the event. As a member of both the WEF and the Alabama Water Environment Association (AWEA) Government Affairs committees, Cummings values the opportunity to cultivate relationships with government officials and other water industry professionals, particularly those in Alabama, he said. “I use the fly-in as an opportunity to promote WEF, AWEA, and the water matters that are on the national agenda,” Cummings said. Because he has participated for 3 years, he has learned about what his state representatives are doing to promote WIFIA legislation and water infrastructure funding. “The event is important because it brings representatives from the water sector together in support of common goals with national perspectives and agenda on water-related matters,” Cummings said. Participants become resources on the topic to congressional officials. “These relationships will be instrumental for future issues as they arise related to water policy and regulation,” Cummings said.